Plan a visit to the best Cancun beaches with Cancun Adventures. Check out which is the best beach in Cancun for swimming or exploring book a tour today! Cancun is the perfect vacation destination for beach lovers who want to relax and travelers who want to pack their itinerary with adventurous activities. And you can certainly enjoy the best of both worlds when you choose to visit these beautiful beaches with Cancun Adventures. Whether you want to try snorkeling or sailing or prefer some shopping and fine dining, you’ll still have plenty of time for relaxing and soaking up some sun! You can even climb ruins and explore a clifftop castle as you learn about ancient Mayan civilizations. Click on the links in the location descriptions below to find out where each destination is located on our Cancun beaches map, and to learn more about the best Cancun beaches. Then choose your favorites and start planning your next vacation today! Isla Mujeres is a gorgeous and isolated island off the shore of Cancun. Arrive in style on a luxury catamaran and see the best Cancun beaches along the coastline as you relax and enjoy the ocean breeze. You can also learn how to sail from our expert crew when you book an Isla Mujeres Tour & Luxury Sailing Adventure with Cancun Adventures—and will get to enjoy a gourmet lunch and drinks from an open bar while on the boat. When you arrive at Isla Mujeres, you’ll have a couple of hours to explore before boarding the catamaran for the return trip. You can wander through the local village, which is full of exotic souvenir shops and local boutiques, or discover great places to sample authentic Mexican cuisine. You can also jump in the pristine water of the famous Playa Norte for some paddleboarding or snorkeling and see the local tropical wildlife. When you’re done sightseeing, spend some time playing at the beach and relaxing. It is also possible to book a private tour and sailing adventure—perfect for a romantic getaway. Playa Paraíso is a small beach that lies at the base of an ancient clifftop castle. When you book a Tulum Private Tour with Cancun Adventures, you get the full insider experience. Our expert bilingual tour guides will tell you all about the history and culture of the Mayans while navigating the ruins they once inhabited. You’ll get to explore all the Mayan structures at Tulum, including Castillo, the clifftop castle overlooking the ocean, and the Templo de las Pinturas, which contains a partially restored mural. Then you can take a dip in the water at the beautiful beach behind the Mayan castle. You’ll also be treated to a meal of authentic Mayan cuisine, which will make you feel like you were transported to the past and dining with Mayan royalty. Everything about Playa de Punta Venado and the Coba Ruins is breathtakingly beautiful. The guided Coba & Reef Adventure takes you to another Mayan city, this time right in the middle of the Mexican jungle. The city of Coba is approximately 2,000 years old and contains a large network of stone causeways. At the Coba ruins, you’ll have the opportunity to climb the tallest Mayan temple, Nohoch Mul, which is 138-feet tall (42 meters). The view of the jungle from the top of the Coba ruins is stunning and also just happens to be the perfect place to catch your breath and snap some pictures. 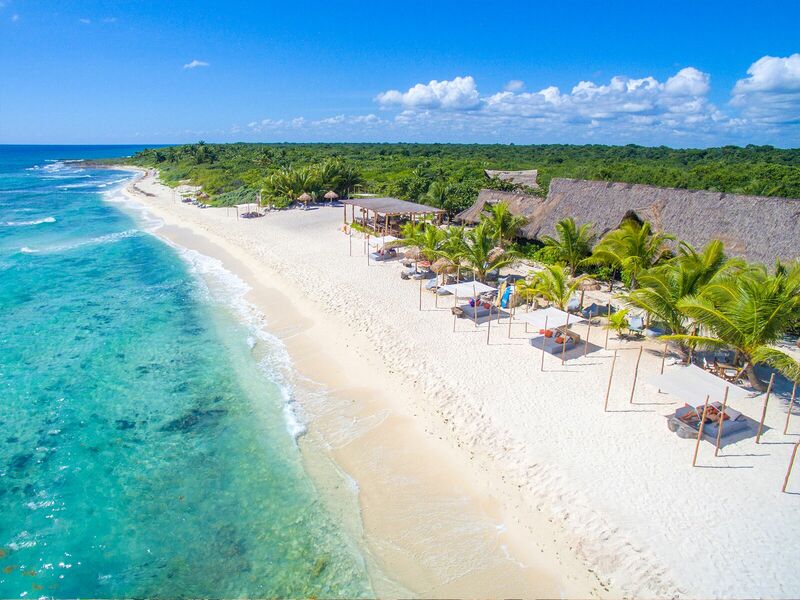 After you’ve finished your Coba climb, the fun continues at Playa de Punta Venado, which is arguably the best beach in Cancun for swimming and snorkeling. The reef is filled with colorful coral, as well as tropical fish and other marine wildlife. Finally, finish the day at Cancun Adventures’ exclusive beach hideaway where you can relax and have lunch. At Cancun Adventures, we aim to provide visitors with the most exciting and educational experiences possible. We hire local bilingual tour guides who are knowledgeable about the Mayan history and culture to ensure that you get accurate facts and entertaining stories. We also create unmatched adventure experiences so you can have the trip of a lifetime. In addition to the best Cancun beaches featured above, we offer various tours for every traveler. Some of our other popular tour choices include zip lining, ATVs, swimming in cenotes (natural freshwater sinkholes), and swimming with dolphins. Visit our website for more information about all of our tours and private tours alike, then contact us to book your tours with Cancun Adventures. You can also find deals and discounts on our special offers page! Create unforgettable memories in Cancun by embarking on the adventure of a lifetime with our wide selection of world-class tours! Learn more about us, Subscribe to our newsletter below, or contact us for more infomation! © 2018 Cancun Sea Adventures, S.A.P.I. de C.V., All Rights Reserved.